Constructed from 1845-47, the Athenæum building on Sixth Street opposite Washington Square was the second home of the Athenæum's collections. 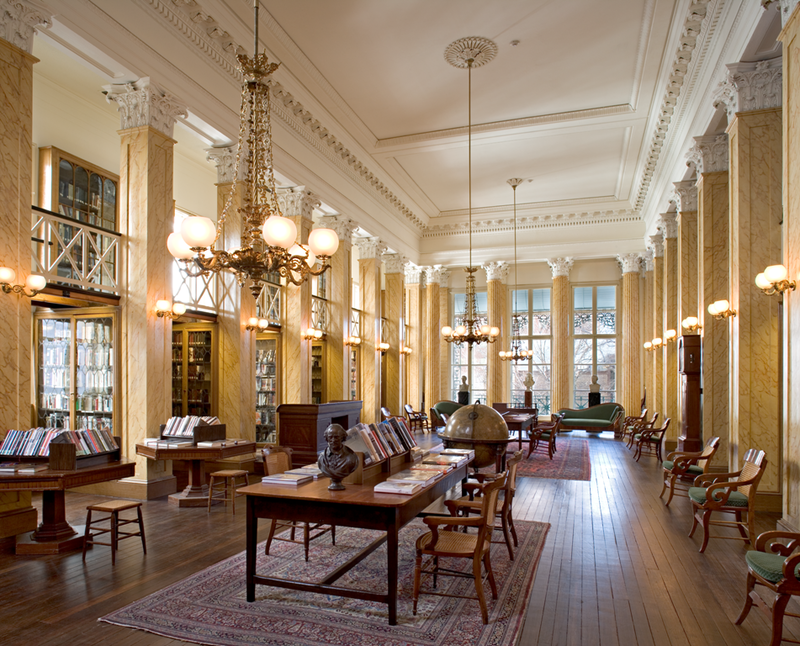 Founded in 1814, the Athenæum first operated out of Philosophical Hall until enough funds were obtained to construct a building to fit the Athenæum's needs. Architect John Notman developed a three-story brownstone Italianate Renaissance Revival building designed to hold the Athenæum's collections on the second floor. Offices on the two other floors have been rented to lawyers, architects, or organizations such as the Historical Society of Pennsylvania, the American Institute of Architects, and the Victorian Society in America. The Members Reading Room in the Athenæum has been the primary location for members to meet, read, converse, and fulfill the Athenæum's primary mission, "to disseminate useful knowledge," since the Athenæum building opened in 1847. The Members Reading Room's decor has changed very little since the nineteenth century; most of the furniture and gasoliers in this 2008 photograph are original pieces that members have been using for more than a hundred and fifty years. Preservation and ongoing repairs since 1975 have given modern members the chance to indulge in an experience shared by thousands of previous members. In the nineteenth century, members of the Athenæum and their guests would go into the News Room specifically to read newspapers, periodicals, and political journals from across the United States and Europe. During the twentieth century, the room pictured here evolved from the News Room into the Henry Paul Busch Reading Room, where visitors and researchers could view the Athenæum's expansive collection of rare books, manuscripts, and architectural drawings in elegant surroundings. The colors of the walls, wood-grain accents, and plaster designs have been refurbished since the 1970s to reflect the style of the original room. A second floor of book stacks was added to the Reading Room in 1990 to allow more access to the Athenæum's collections. The book stacks were subsequently removed. The decline of member-supported libraries in the early twentieth century led the Athenæum into decades of understaffed and underpreserved archives and facilities. The actions of George Vaux (at left in this photograph) after he was elected president of the Athenæum in 1965 led the failing library into becoming one of the predominant research institutions in Philadelphia. Vaux, who graduated from Haverford College with a degree in physics and was an accomplished photographer, inherited his membership in the Athenæum from a family member in 1948 and began to take more interest in the operations of the library. With his experience incorporating innovative practices at charitable institutions in Philadelphia, Vaux swiftly changed the administration of the Athenæum. He replaced inactive board members with scholars and administrators who had more experience running not-for-profit institutions, while simultaneously attracting community leaders and generous donors. Preservation of the Athenæum's building and collections was followed with projects and programming that expanded the Athenæum's scope and education potential. 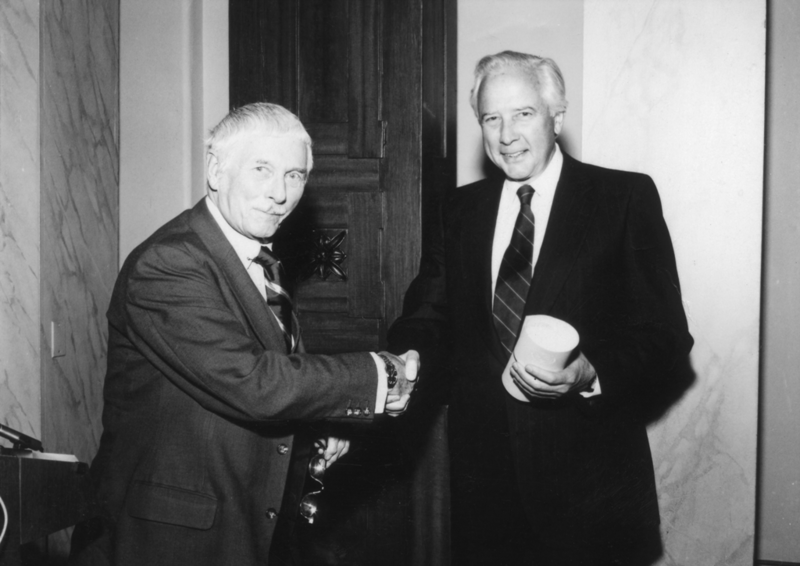 Popular writers like David McCullough, pictured here shaking hands with Vaux, gave lectures for Athenæum members. Vaux remained president of the Athenæum board for 31 years, until his death in 1996. Thomas U. Walter was a significant architect around Philadelphia and later gained a national reputation by designing the United States Capitol Building. 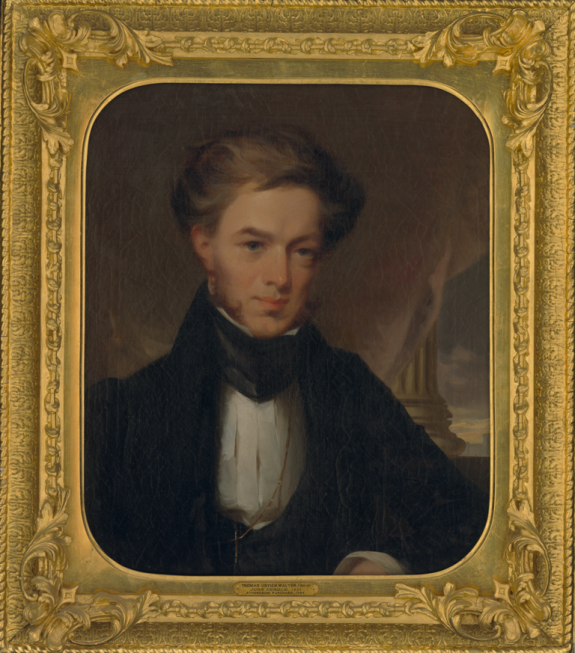 Born to a family of masons and raised in Philadelphia, Walter was the understudy of architect William Strickland for ten years before opening his own architectural practice in 1830, a practice that later had international clients, as well. Early Walter designs included the Philadelphia County Prison (Moyamensing) and the Girard College of Orphans. He submitted designs for the Philadelphia Athenæum, but the institution selected plans from John Notman. 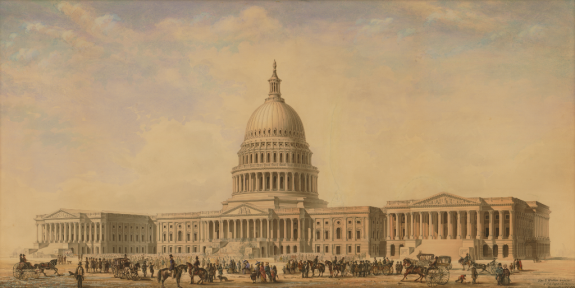 Walter and his staff became the architects for the United States Capitol Building in 1851 after submitting designs to expand the bottom floors and add a domed cap to the building. Just before Walter's death in 1887, he began initial design work for Philadelphia's City Hall, under lead architect John McArthur Jr. 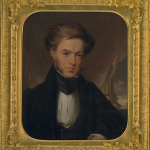 The crown jewel of the nineteenth-century holdings is the complete archive of Thomas Ustick Walter (1804-87), founder of the American Institute of Architects, including his personal diaries, office records, and 500 drawings. 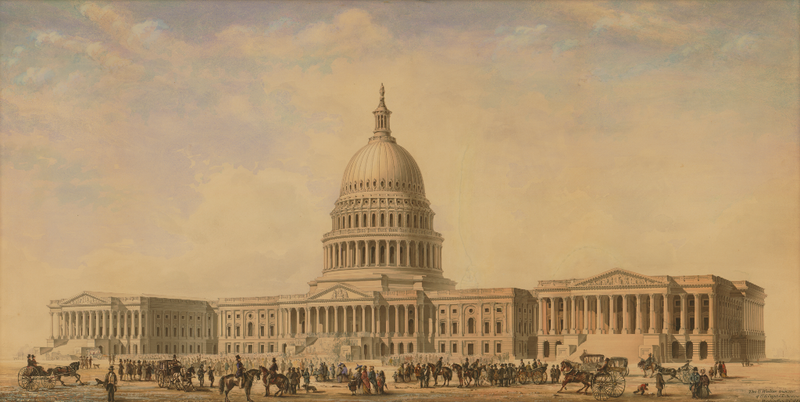 Among the drawings are those for the dome and wings of the United States Capitol, pictured here. The architectural holdings of the Athenæum have drastically increased since the 1980s, after the Athenæum began to actively seek out local architectural firms willing to donate or sell their designs, production materials, and business papers. With these architectural collections, the Athenæum has joined with other local institutions to establish the American Architects and Buildings Project, a digital resource for exploring the rich architectural history of Philadelphia and the Mid-Atlantic region. 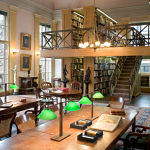 The Athenæum of Philadelphia, a non-profit, member-supported library, was founded in 1814 “to disseminate useful knowledge.” Threatened for its very existence with the advent of the city’s free library in 1894, the organization subsequently recovered and ultimately thrived as it reinvented itself as a special- collections library with related public exhibitions, lectures, and publications. Unlike modern tax-supported public libraries, athenæums were private organizations established as associations of dues-paying subscribers or as stock companies—in which the purchase of a share made one an owner. Early member-supported libraries such as The Library Company of Philadelphia (1731), The Redwood Library in Newport, Rhode Island (1747), The Charleston Library Society (1748), and The New York Society Library (1754), began appearing in America’s major coastal towns in the eighteenth century. By the early nineteenth century, when neoclassicism was the popular style, member-supported libraries were often named for Athena, the ancient Greek goddess of arts and literature. This name became synonymous with the term library in towns like Zanesville, Ohio; Keokuk, Iowa; and La Jolla, California, as Americans moved west in the later nineteenth century. 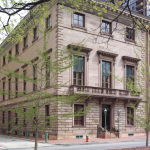 The Athenæum of Philadelphia’s founders were leading citizens of what was then the largest city in the United States, including Chief Justice William Tilghman (1756-1827), Jacob (1788-1856) and Benjamin Gratz, George and Roberts (1786-1836) Vaux, Nicholas Biddle (1786-1844), Horace Binney (1780-1875), George Cadwalader (1806-79), and Mathew Carey (1760-1839). They declared “their first and immediate object” to be “the collection, in some central place, of American and foreign periodical publications of political, literature and science, maps, dictionaries, and other books of reference to which access might be had at all hours of the day.” Many of the founders were also members of The Library Company and The American Philosophical Society, but neither of these institutions remained open for extended hours, nor did they specialize in periodicals and books of reference. For nearly three decades, the Athenæum occupied the first floor of Philosophical Hall, next to Independence Hall, across Fifth Street from The Library Company of Philadelphia. These were years when the Athenæum grew rapidly in prestige, membership, and the variety of books and periodicals available to its stockholders. By 1825, Jonathan P. Sheldon of New York declared that every visitor to Philadelphia should go to the Athenæum for “New York has no institution of the kind to compare with it. A comparison of the Libraries of the two cities and especially the situation of each as to pecuniary matters, would place New York far behind her rival in matters of correct taste and liberality.” The members regularly brought visitors to the rooms, dutifully entering their names in a “Strangers’ Book” kept at the librarian’s desk. These ledgers record visits by John Quincy Adams, Andrew Jackson, Henry Clay, Giuseppe Garibaldi, Martin Van Buren, Millard Fillmore, James Buchanan and, on October 1, 1825, “General LaFayette,” introduced by “all the members.” The occasion of the Marquis de LaFayette’s visit prompted the members to elect him their first honorary member. 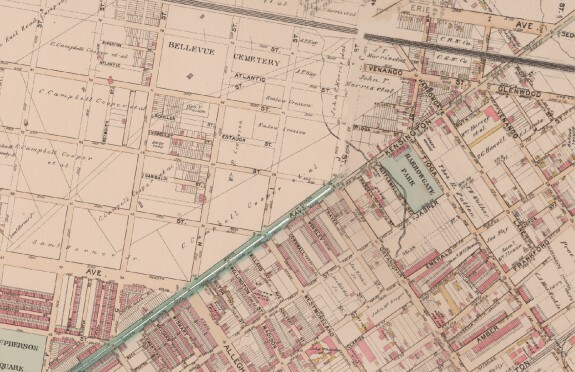 In 1829 William Lehman, a wealthy and bookish druggist, bequeathed $10,000 to the library for “the acquisition of a suitable building.” However, it would not be until 1845 that a building lot on Sixth Street opposite Washington Square was finally acquired and an architectural competition announced. Ultimately designs were received from such major Philadelphia architects as William Strickland (1788-1854), Thomas Ustick Walter (1804-87), and John Haviland (1796-1865), but the design adopted and constructed came from a recent Scottish emigrant, John Notman (1810-65), who with his Athenæum design introduced to American the first example of a brownstone Italianate Renaissance palazzo made popular in London by Charles Barry at the Travellers’ Club (1829). The three-story building provided two floors of rental space. Lawyers occupied the ground floor while architects and the Historical Society of Pennsylvania settled on the third floor. 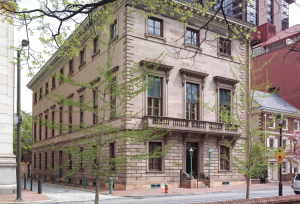 Eventually the Philadelphia chapter of the American Institute of Architects became a tenant. The AIA would presage the future by calling for the establishment of an architectural library at the Athenæum. Today the Athenæum occupies all three stories of the original building as well as another level inserted under the building in the 1970s for additional high-security, temperature- and humidity-controlled collection storage. For the Athenæum and the other member-supported libraries in the city, the opening of the Free Library of Philadelphia in 1894 was a cataclysmic event. Operating under the motto Liber Libere Omnibus—Free Books for All—the Free Library effectively undercut Philadelphia’s membership libraries such as the Mercantile Library, which claimed more than 6,000 members and an annual circulation of 140,000 volumes at the time. The Mercantile Library eventually failed and was absorbed by the Free Library. 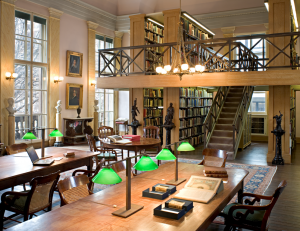 At the Athenæum, membership steadily declined, even with the approval for book circulation in 1855, and its modest endowment proved inadequate to properly maintain the building, which also affected rental income. By the 1920s the board of directors was hiring retired clergymen as caretaker librarians and the future appeared bleak. Encouraged by the post-World War II urban renewal of Society Hill and the establishment of Independence National Historical Park, the directors hired a succession of younger librarians in the hope of revitalizing a traditional book circulation service, but efforts to increase endowment and raise funds for restoration of the building were generally unsuccessful. The downward spiral was arrested in the 1960s and 1970s when George Vaux (1908-1996), an energetic direct descendant of an Athenæum founder, was elected president of the board of directors. He replaced inactive board members with scholars and administrators who brought to the table extensive experience with not-for-profit institutions. 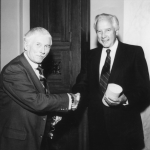 Simultaneously he attracted community leaders and generous donors. The directors then hired their first executive director who was charged with redefining the Athenæum as a special-collections library with related public exhibitions, lectures, and publications, while simultaneously strengthening the traditional membership structure and services. Substantial sums were raised from individual donors and local and national foundations to hire a professional staff and to restore and expand the National Historic Landmark Athenæum building to provide proper facilities to care for and exhibit the collections. The new leadership first focused on the extensive collection of rare books and periodicals surviving from the period when the Athenæum had been founded, flourished, and erected its building. 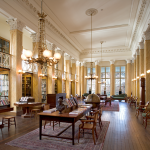 The promising extension of the collection scope to include Victorian material culture prompted an invitation to the newly founded Victorian Society in America to establish its headquarters in the Athenæum building. Thus the library was overnight introduced to a national audience that attracted the interest of scholars and collectors such as Samuel J. Dornsife (1916-1999), whose lifetime collection of rare design books and trade catalogues devoted to Victorian-era architecture, decorative arts, and interior design, ultimately came to the library where it has provided a rich core of documentary sources for the authentic restorations of Victorian buildings as well as licensed commercial lines of authentic reproduction lighting fixtures, wallpapers, textiles, and paint colors. Subsequent collecting greatly expanded those holdings. The Athenæum’s rare book collection originated with a substantial early nineteenth-century gift from Samuel Breck of Sweetbrier (1771-1862), and the time-honored practice of libraries collecting collectors’ collections continued right through to the twenty-first century. Among the most distinctive donations have been theater historian Irvin R. Glazer’s (1922-96) collection of books on America theater buildings; Robert L. Raley’s architecture and garden design books; former director of the Philadelphia Museum of Art Evan Turner’s collection of early books and manuscripts on the history of books and printing dating from the fifteenth through the nineteenth centuries assembled by his father, Professor Albert Morton Turner; and Eli P. Zebooker’s collection of eighteenth- and nineteenth-century maps and prints of Philadelphia. 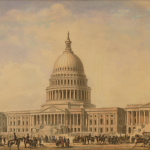 The primary focus of the library’s research collections gradually became American architecture prior to 1930. Recognizing that no institution in Philadelphia actively collected architectural records or specifically sought to support research on architects and builders, the Athenæum undertook that role in the early 1970s, accumulating over time 220,000 architectural drawings, 300,000 photographs, and supporting documentation representing the work of 26,500 architects and engineers. Of special interest has been the collection of books known to have been owned or consulted by architects who practiced in the greater Philadelphia region. For that reason the library acquired whenever possible the intact office libraries of early architectural firms as well as their client records and drawings. One example of such an omnibus acquisition is the office records, library, and drawings of Theophilus P. Chandler (1844-1920), founder of the University of Pennsylvania School of Architecture. The Athenæum also became the official repository of the records of the Philadelphia Chapter of the American Institute of Architects. The Athenæum’s architectural drawing collection has focused primarily on Philadelphia architects and builders ranging from master builders such as William Palmer (1771-1815) and Owen Biddle (1774-1806) to the earliest professional architects: Benjamin Henry Latrobe (1764-1820), John Haviland (1792-1851), William Strickland (1788-1854), and Robert Mills (1781-1855). The crown jewel of the nineteenth-century holdings is the complete archive of Thomas Ustick Walter (1804-87). The twentieth-century architectural holdings are substantial and include sixty thousand drawings representing the career of Paul Philippe Cret (1876-1945), the office archives of the country-house architects Walter Mellor (1880-1940) and Arthur I. Meigs (1882-1956), the complete archive of the Art Deco theater architect Louis Magaziner (1878-1955), and the office records of the Henry D. Dagit & Sons dynasty, and many others. The drawings of decorative painters and craftsmen such as stained-glass makers and decorative ironsmiths are more ephemeral than those of architects. Holdings at the Athenæum include a comprehensive collection of the celebrated stained-glass master, Nicola D’Ascenzo (1871-1953); the archives of the decorative painter George Herzog (1851-1920), who was responsible for Philadelphia City Hall, the Union League Club, and the Masonic Hall; and the New York City artists H.D. & J. Moeller—among others. 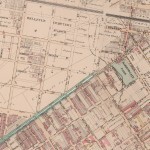 In 1999 the Athenæum conceived and the William Penn Foundation funded a cooperative agreement with the University of Pennsylvania Architectural Archives, the Philadelphia Historical Commission, and the Pennsylvania Historical and Museum Commission, to establish the Philadelphia Architects and Buildings Project (later renamed the American Architects and Buildings collection) to offer free of charge online access to more than 26,500 biographical essays of architects, engineers, and contractors and information on 270,000 projects and buildings, supported by 135,000 digitized images. Roger W. Moss is Executive Director Emeritus, the Athenæum of Philadelphia, which he directed from 1968 to 2008. Simultaneously he was an adjunct professor in the Historic Preservation Program at the University of Pennsylvania. He is the author of more than a dozen books on architecture and design, including the trilogy Historic Houses of Philadelphia (1998), Historic Sacred Places of Philadelphia (2005), and Historic Landmarks of Philadelphia (2008) published by the University of Pennsylvania Press. Greiff, Constance M. John Notman, Architect, 1810-1865. Philadelphia: The Athenæum of Philadelphia, 1979. Moss, Roger W. Philadelphia Victorian: The Building of The Athenæum. Philadelphia: The Athenæum of Philadelphia, 1998. Moss, Roger W. Historic Landmarks of Philadelphia. Philadelphia: University of Pennsylvania Press, 2008. Includes essays on Athenæum, Library Company, and Free Library. Moss, Roger W. Athenæum Profiles: A Not-For-Profit Education. Newark, Del. : Oak Knoll Press, 2014. Thompson, Maria M. “The Athenæum of Philadelphia Celebrating 200 Years.” Antiques & Fine Art 13 (2014): 146-149. Wendorf, Richard, Ed. America’s Membership Libraries. Newark, Del. : Oak Knoll Press, 2007. Includes essays on all the surviving membership libraries in the United States. Theophilus P. Chandler, Jr. Collection, Athenæum of Philadelphia, 219 S. Sixth Street, Philadelphia. Thomas U. Walter Collection, Athenæum of Philadelphia, 219 S. Sixth Street, Philadelphia. Athenæum of Philadelphia, 219 S. Sixth Street, Philadelphia.